KALIMPONG January 30: Great freedom fighter Dal Bahadur Giri, whose contribution towards the national struggle for freedom is inseparable, was born on 8th March 1886 in Darjeeling. Giri, who died in the tender age of 36 years, had settled in Kalimpong in the year 1916. Later he joined the congress party to enter into active politics. Giri participated many conferences in Delhi, Mumbai, Nagpur and in other states. He led the freedom movement after the establishment of congress party at Pedong, Kalimpong in 1920.Giri, who opposed the arrest of Gandhiji, was also arrested by the British government on 26th June 1921 and was released later. Again in the month of November 1921 he was arrested and was jailed in Hooghly and then to Brahmaputra. Giri died in the year 13 November 1924.On his demise, the Father of the Nation, Mahatma Gandhi also sent a condolence letter to his family on 13th November 1924, where Gandhiji mentioned Giri as the brave son of the soil. 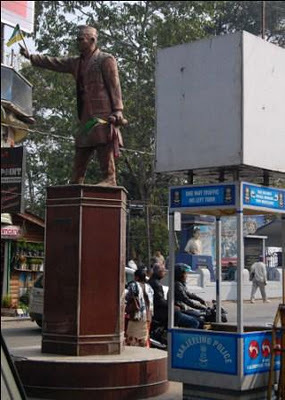 He used to be called as the Gandhi of the hills.Giri’s statue was constructed at Thaney dara in Kalimpong with a cost of 50 thousand rupees. During the inaugural function of the statue, secretary of Freedom Fighter Federation Daljit Sen said that his contribution was not less than Bhagat Singh and Chandra Shekhar Azad.The country remembers every martyrs on 26th January and 15th August but no one remembers Giri, which is pretty sad part.Similarly Republic Day was celebrated majestically in Kalimpong but no one remembered the contribution of Giri. There are many regional flags on the statue of Giri but not a single national flag. It sometimes gives a nasty feeling that people has really failed to remember Giri, even the statue cannot be visible due to the pasting of numerous posters. Great National freedom fighter Dal Bahadur Giri, whose contribution towards the national struggle for freedom is inseparable, was born on 8th March 1886 in Darjeeling. Giri.